Friday, October 26, 2018 8:30 a.m. - 4:00 p.m. The United States Supreme Court last term rendered several vital decisions. The Court upheld the President’s Travel Ban, overturned compulsory union dues for public employees, held that California could not require “pregnancy crisis centers” to provide information about abortion services, and held that the police must generally obtain a warrant in order to engage in cell phone tracking. Other important decisions concerned arbitration of employment disputes, Congress’s attempt to compel the states to ban sports betting, automobile searches, a baker’s religious freedom to refuse to bake a cake for a gay wedding, political gerrymandering, and police misconduct litigation. These and numerous other decisions of last term will be discussed and analyzed at the program. At the end of the last term Justice Anthony Kennedy announced his retirement. The program will explore the likely impact of his retirement. 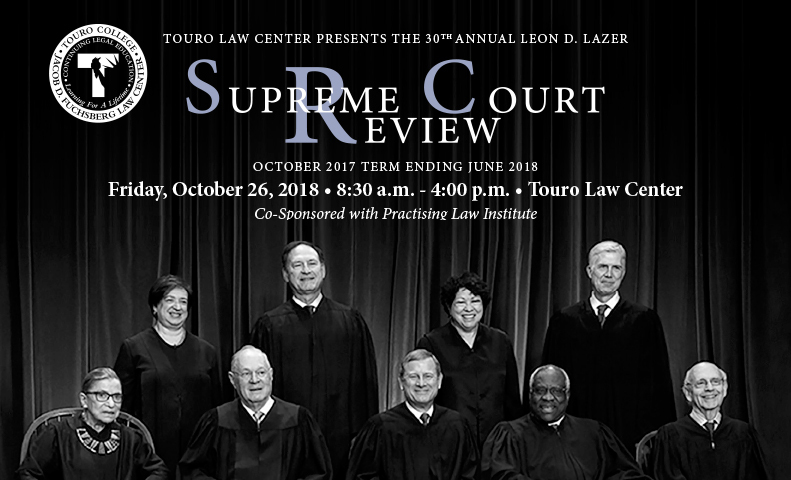 The highly accomplished faculty includes a law school Dean and constitutional scholar, a federal district court judge, a former law clerk to the Chief Justice of the United States, law school professors, civil rights experts, and trial and appellate litigators. This well attended program is in its 30th year. It is a must for anyone interested in the United States Supreme Court and constitutional law.